The modern use of chemical weapons began with World War I, when both sides to the conflict used poisonous gas to inflict agonizing suffering and to cause significant battlefield casualties. Such weapons basically consisted of well known commercial chemicals put into standard munitions such as grenades and artillery shells. Chlorine, phosgene (a choking agent) and mustard gas (which inflicts painful burns on the skin) were among the chemicals used. The results were indiscriminate and often devastating. Nearly 100,000 deaths resulted. Since World War I, chemical weapons have caused more than one million casualties globally. As a result of public outrage, the Geneva Protocol, which prohibited the use of chemical weapons in warfare, was signed in 1925. While a welcome step, the Protocol had a number of significant shortcomings, including the fact that it did not prohibit the development, production or stockpiling of chemical weapons. Also problematic was the fact that many States that ratified the Protocol reserved the right to use prohibited weapons against States that were not party to the Protocol or as retaliation in kind if chemical weapons were used against them. Poison gasses were used during World War II in Nazi concentration camps and in Asia, althogh chemical weapons were not used on European battlefields. The Cold War period saw significant development, manufacture and stockpiling of chemical weapons. By the 1970s and 80s, an estimated 25 States were developing chemical weapons capabilities. But since the end of World War II, chemical weapons have reportedly been used in only a few cases, notably by Iraq in the 1980s against the Islamic Republic of Iran. After 12 years of negotiations, the Chemical Weapons Convention (CWC) was adopted by the Conference on Disarmament in Geneva on 3 September 1992. The CWC allows for the stringent verification of compliance by State Parties. The CWC opened for signature in Paris on 13 January 1993 and entered into force on 29 April 1997. The CWC is the first disarmament agreement negotiated within a multilateral framework that provides for the elimination of an entire category of weapons of mass destruction under universally applied international control. 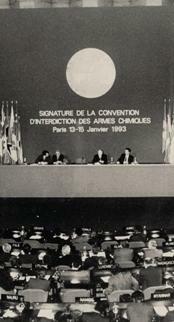 In order to prepare for the entry-into-force of the CWC, a Preparatory Commission of the Organisation for the Prohibition of Chemical Weapons (OPCW) was established with the responsibility to prepare detailed operation procedures and to put into place the necessary infrastructure for the permanent implementing agency provided for in the Convention. Headquarters for this organization were established in The Hague, the Netherlands. The CWC entered into force on 29 April 1997, 180 days after deposit of the 65th instrument of ratification. With the entry-into-force of the Chemical Weapons Convention (CWC) on 29 April 1997, the Organisation for the Prohibition of Chemical Weapons (OPCW) was formally established. The OPCW Technical Secretariat is located in The Hague, the Netherlands. Currently, 189 nations, representing about 98% of the global population, have joined the CWC. The OPCW mission is to implement the provisions of the CWC and to ensure a credible, transparent regime to verify the destruction of chemical weapons; to prevent their re-emergence in any member State; to provide protection and assistance against chemical weapons; to encourage international cooperation in the peaceful uses of chemistry; and to achieve universal membership of the OPCW. The cooperation between the United Nations and the Organisation for the Prohibition of Chemical Weapons is regulated by the relationship agreement between both organisations adopted by the General Assembly in September 2001.